Better Button - Knowledge Base - Why isn't my button showing on my product page? Knowledge Base Frequently Asked Questions Why isn't my button showing on my product page? If you've created a button and added it to campaign, the next step to take is to setup the campaign to point to the proper element on your page. In most cases this is the "Add to Cart" button. If you are using Shopify, we have already setup some of the most common themes to be used out of the box. Simply navigate to your campaign settings and select your theme from the "Shopify Theme" dropdown. If you are not using Shopify or your Shopify theme is not supported, you can manually add a custom element. To use a custom element, you'll need to identify the CSS selector for your add to cart button. This could be a class name, ID or some other CSS selector which points at the button. 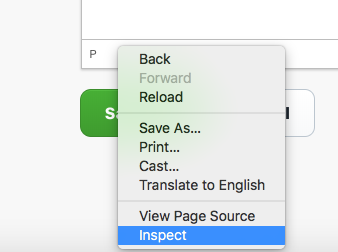 On Chrome and Firefox, you can right click on your add to cart button and select "Inspect Element" this will bring up your developer tools so you can see the HTML of your page. Once you have identified the CSS selector for your button, you can add it to your campaign settings. If you've entered the correct selector, you should see the add to cart button change on your website and your campaign will be fully active.